The holidays are here, and you can decorate with fresh greenery to fill your home. With these easy steps, you can make a fresh wreath in no time at all. There aren’t a lot of rules, but some guidelines will give you confidence and help you get started. Here at the farm, we use wood-stem evergreens like cedar, ligustrum, holly, pine, and juniper, as well as herbs like rosemary, lavender, sage, thyme, and then add fresh flowers to make it pop. Be creative and use what you have in your own backyard, or pick up a few items at the store. 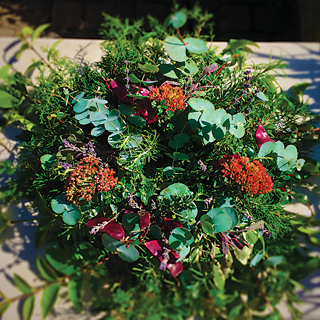 Only a few simple things are required to get started: fresh greenery, herbs, flowers, and snips; a pre-made wreath form from a craft store (or make your own with floral foam and a wire frame); pruning shears; and a basket for gathering materials. We recommend garden gloves, but they aren’t required. 1. First, gather your greenery, herbs, snips, and flowers in your basket. Prune pieces ranging in length from two to six inches. 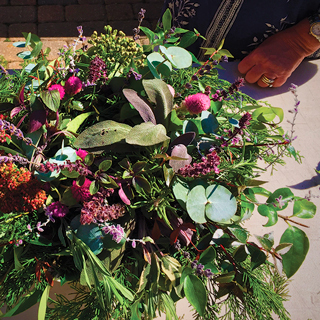 Cutting greenery, herbs, and flowers at different lengths creates visual interest when you’re assembling your wreath centerpiece. Look for interesting accents to use in groups of three, five, or seven. Our artist eyes are always drawn to design and patterns in odd numbers. 3. Thoroughly soak floral foam in water. and your centerpiece stays fresher longer. 5. The longer stems go around the outside with the shorter ones filling in the top. Insert foliage at different angles for the best look, not straight up. Create three focal points (at four, eight, and twelve o’clock positions on the wreath form), and fill around these in all directions until they meet. Finish it off with final accent pieces that vary in size, color, texture, and shape. you can keep adding color and scents from your yard to prolong the life of your centerpiece. 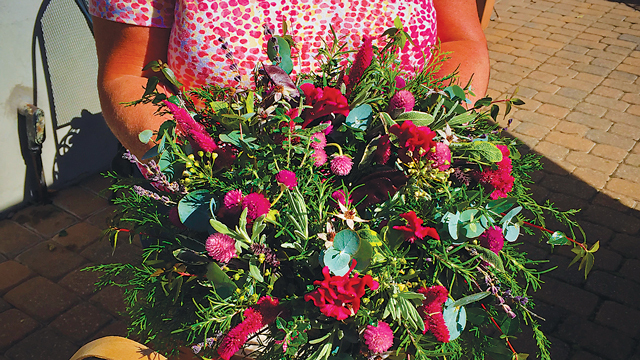 Creating a beautiful centerpiece or wreath is much easier than you would think if you allow yourself creative freedom. At the farm, some guests might start out apprehensive, but by the end of the experience, they are proud of their creations and ready to make another. 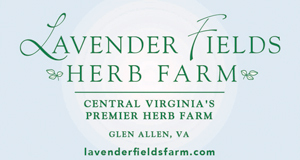 Sherry Halphen has been a part of Lavender Fields Herb Farm for over nine years. She lives in Mechanicsville with her family.